PV solar panels can heat your water tank too. Traditionally, evacuated solar tubes and flat-plate thermal panels were a common type of solar heating until the advent of PV-powered water heating. This breakthrough is a solar heating management product that gives an additional benefit from your PV solar panels excess, and an extension to battery storage and exporting to the grid. This nifty device means you don't have to pay to import expensive electricity for heating your hot water tank. Standard water heating costs are approx 25% (depending on tank efficiency) of a typical household's energy costs. Most households use an immersion heater to heat hot water, so it makes perfect sense to adopt PV solar technology that can provide your hot water demands too. To use an immersion element is the most expensive way to achieve heated water, so using solar technology is smarter-by-design. Compatible system sizes: 1.0 - 4.0 KW. Size: 198 mm x 132 mm x 68 mm. Over the many years of experience within the solar industry, I have seen many changes. The most significant shift has to be the change in popularity from solar heating to PV solar systems. As a result, photovoltaic arrays have become popular, but few are adopting solar heating products such as evacuated tubes. An inexpensive device that converts excess PV-generated electricity into a daily tank of complimentary hot water - what's not to like? The best ideas are always the most straightforward. The emergence of self-consumption by using free-generated electricity gives added value to a PV-investment. An immersion heater element is the most expensive way to achieve hot water, so using sun-powered technology for your hot water requirements makes sense. This unobtrusive and easy to install investment will save you money far into the future - just like PV-tech itself. Installation is with minimum fuss. DIY installations are not possible because installers require a Part P electrical qualification legally. This answer depends on the size of your PV system and the amount of hot water you use, but a four-person family with a 4KW PV panel system can expect to save around 200 GBP per year. (Figure excludes savings from battery storage at approx 520 GBP per year). Will I still get my export payments? Yes. Currently, export payments, pay for 50% of all your units exported. This system means you can use all your units and still receive the export payments as per usual. Do I need a hot water tank? Yes. You need a hot water tank with an immersion heater element to benefit from a converter. The management system will automatically control the heating coil throughout the day. Not suitable for Combi boilers. If the PV panels aren't generating, do I still get hot water? Absolutely. Because the converter works alongside your existing hot water system, your tank will still get heated in the traditionally imported-electricity way. Can I see how much energy I have saved? We wouldn't have it any other way. The converter records and displays how much energy used and converted into financial savings. Can I still use my Economy 7? Yes, The system has a built-in timer that allows three easy-to-use options. It can be programmed every 24 hours and so take full advantage of your off-peak supply if required. Can it display the water temperature in the tank? 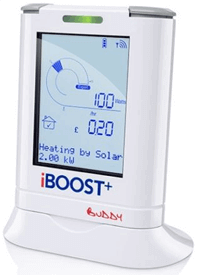 Yes, an optional temperature sensor can be fitted to the PV to hot water converter and display the water temperature. All converter installations come with a standard five-year warranty.